As a long time practitioner of HeartMath® tools, I took notice of the chapters in Shannon McRae’s book, The Healing Effects of Energy Medicine, where Shannon talks about the healing power of appreciation and forgiveness. I highly recommend Shannon McRae’s book, because of her authenticity coupled with the measurable results I personally achieved–and so can you. Although my body is generally healthy, I harbor deep emotional blocks that have stubbornly been there since very early in my life. Most of us have had traumatizing experiences, which are long forgotten by psyche, yet the body holds the imprints of such events. 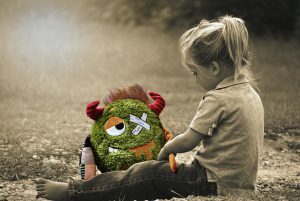 A child projects her hurt onto her toy. Childhood traumas don’t need to be severe to create long lasting effects. Being laughed at or made fun of “in good humor” may register as an assault to one’s self-identity. No one survives childhood unscathed; it appears to be part of the process of growing up, even in supportive homes. Of course, many children have endured unimaginable traumas while growing up, sometimes at the hands of their caretakers. There is a wide spectrum of memories held within the body, which may have been pushed down by the mind as a defensive maneuver in order to survive the event. The following practice dissolves emotional blockages without dredging up the past. You are working with and tapping into the body’s own intelligence for healing. McRae writes that “if you have memories of negative events [. . .] you can work toward healing yourself by letting them go and forgiving yourself for having carried them around” (94). She continues to emphasize the necessity of forgiving oneself first for having carried the memories around for so long. No judgement, no dredging up the images from the past; simply align yourself with forgiveness and appreciation, and let go. By doing this simple practice (outlined below), you emanate appreciation and forgiveness. You align or cohere your own energetic vibration with the high frequencies of appreciation and forgiveness. Interestingly, even reading about it raises your vibration, but let’s take it another step further. Sound good? Great, now let’s bring some evidence-based science into the mix to satisfy the Western mind. As always, I recommend adjusting your own practice session as needed to achieve a state of higher vibration, or heart coherence—the rhythmic pattern of your heart that gets you into the zone of healing. The HeartMath tools are optional, but is handy to actually measure your progress. I began by sitting comfortably with a straight spine, and in a cross-legged position. If you’re not a yogi, then simply sit in a chair with a straight spine. I tune in with the Adi Mantra, again, because I’m a yogi. Do something to honor your practice, light a candle, take three deep breaths, or simply sit quietly before you begin. Next I focused on the area around my heart and let my awareness drop from my thinking mind down around my heart center. Slow down your breathing and keep the inhale and exhale the same length, as best you can without losing focus on your heart. 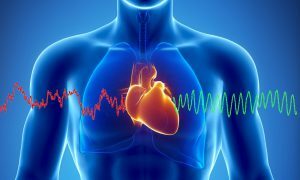 At the beginning of my practice, I was in a state of low heart coherence, meaning that my vibrational pattern was low. 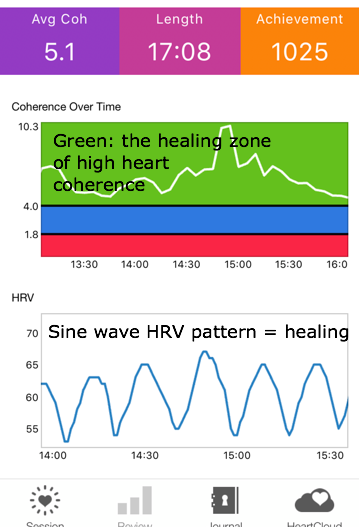 You can see the jagged HRV pattern, which means that your system is not harmonious and not in a state of inner calm. The red of the graph also indicated a low vibrational state. 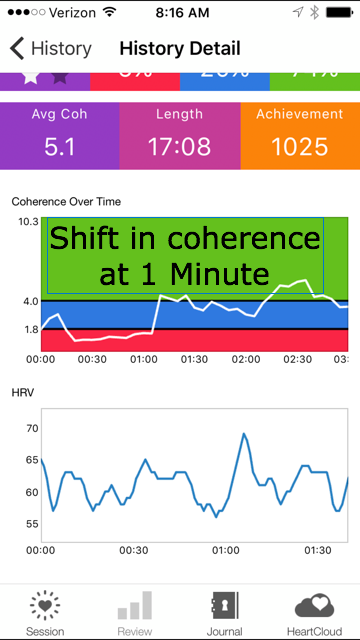 I use the Inner Balance iPhone app by HeartMath. I began to breathe deeply into my heart center, focusing on the word appreciation, and exhaling the word forgiveness. Then I began to feel appreciation as I inhaled, and feel forgiveness as I exhaled. You can think of something small that you appreciate, I focused on the warmth of the fire in the fireplace next to me and moved on to appreciation for my health and well-being. 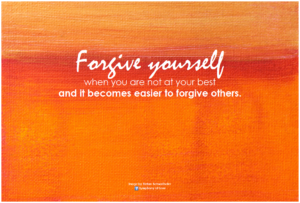 Regarding forgiveness, I focused on forgiving myself for holding onto any emotional hurt that was remembered or not. I forgave myself without judgement—I just began to let it go. Generating the actual feelings of appreciation and forgiveness may take practice. I’ve been a yogi and HeartMath practitioner for years, so be patient with yourself as you begin. I started on Level One, like most everyone does. The point is that you do increase your resilience as you continue to practice, and as you do, your baseline of coherence raises. This simply means that your internal “batteries” are becoming more fully charged, and with a daily practice they will stay that way, just as when you plug in your cell phone at night for a daily charge. Just after the one-minute mark there was a shift in my vibrational state as I moved out of the red zone, through the blue zone, and into the green zone. From there I was able to sustain the high vibrational pattern of high heart coherence for the remaining 15 minutes or so. Practice forgiveness and appreciation for 11-Minutes a day or so for 40 days and share your results here—we’d love to hear from you!